A visit to the Crown Inn on Devonshire Rd. is like taking a detour to the past. Construction of this three-storey brick structure was started in 1892 to accommodate visitors to Hiram & Walker's & Sons. Of late Victorian design, the building was the first public hotel facility opened in the community of Walkerville which was expanding with the development of Walker's distillery. 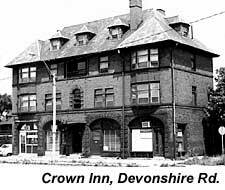 It was in keeping with this development that the late Hiram Walker decided to construct the Crown Inn on Devonshire Rd. adjoining his expanding empire. Within two years the building provided accommodation for travellers and visitors to old Walkerville. From its location on the northeast corner of Devonshire and Assumption, the inn provided a clear view of the Detroit River. This view was made possible as the Walker firm had not expanded to the west. During the early days of the hotel, it provided all the modern facilities of the time under one roof. In addition to the hotel rooms, there were dining and beverage rooms along with a barbershop for the patrons. At the time of the opening of the Crown Inn, Devonshire Road was the main street in Walkerville. The Inn was one of two built by Walker, the other named the Mettawas was located in Kingsville. While the hotel operation vanished in 1921 when the building was converted to a combination apartment building-store facility, the structure has changed little in its exterior appearance in over 100 years. Among other businesses, it housed a motor vehicle license bureau. Today, four small businesses are located on the ground floor with apartments above.